We proudly present a kaleidoscope of our services: outstanding custom picture framing (matting, frame repair, glass replacement, needlework, and shadowboxes, etc), superlative photographic restoration, and the meticulous repair of an infinite variety of your precious personal artifacts. I have been spending all of my energy working on our Facebook page. 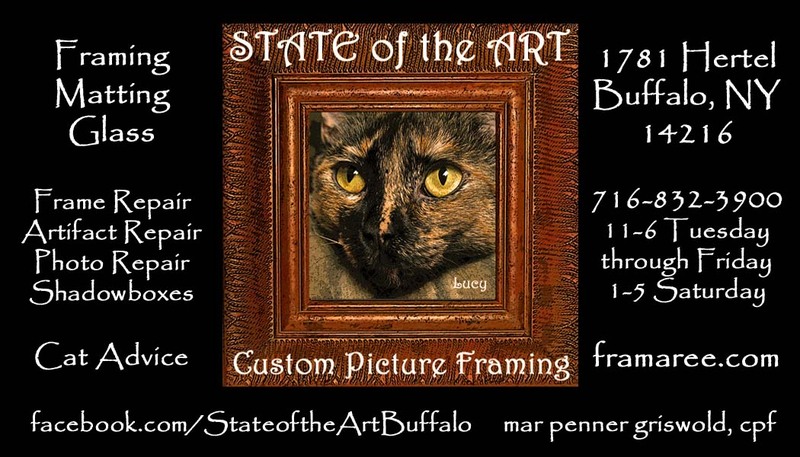 Have fun looking through the many albums of photos of framing and restoration projects (plus a lot of pictures of the gorgeous Mama Lucy, who is now known as the tubby tortie). Give us a Like, thanks! To contact State of the Art, please leave a message on this Facebook page. Your message will be answered as soon as Facebook deigns to show it to me. You can also phone (832-3900) and leave a voice message on my old-fashioned answering machine (on my copper-wired land line). 2019 Update: My hip surgery is all done and I am returning to the shop as of April 2nd. I no longer have an apprentice, but I do have a brand new hip and even though you will see me walking with a cane, I am no longer in pain. I may be moving slowly for a while but I am back! And I cannot wait to be back up to 100% because I love framing – and I hope and pray I have a lot more years of framing ahead of me! What is the state of your art?